Simplified recipes for the crock pot. 3 or more recipes for specific diseases. 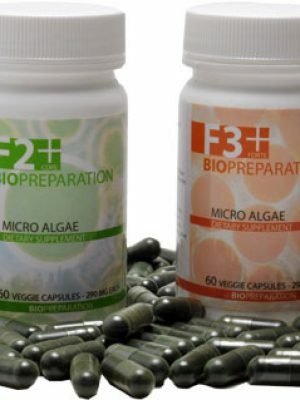 Includes recommended supplements for each illness. Specifies which meats & vegetables are recommended for each disease. Can also be used for healthy dogs whose owner would like to home cook. Whether your beloved dog is sick or you simply want to provide home cooked meals for your healthy dog, our book is a simple solution for providing the right amount of certain food types. Created by a professional holistic practitioner and nutritionist, our pet cookbook recipes for senior dogs who are sick, eliminates the guesswork of choosing the right ingredients which can vary from one disease to another. Our limited ingredient homemade dog food recipes contain a few simple, nourishing ingredients that dogs love and can be quickly prepared with little mess in a crock pot. Can be prepared on top of the stove or oven as well. In this 64 page eBook, Janie guides you through the process of preparing wholesome meals in an easy to read format. You’ll find healthy, limited ingredient recipes for six major sicknesses (listed below) . Limited ingredient recipes are something we encourage when home cooking for your dog to encourage optimal health. This book is meant to provide you with everything you need to comfortably cook for your sick dog. If you’re looking for difficult, lengthy recipes, then this book is not for you. A thorough introduction into each illness including recommended advice and feeding suggestions for your old friend. You’ll find up to 5 recipes for Cancer, Liver Disease, Kidney Disease, Heart Disease, Pancreatitis, and Seizures so that you can provide your dog with variety. A thorough section of inter-changeable meats, grains, and vegetables for each illness, so that you can create even more of your own recipes. Three pages of very helpful tips and recommendations. Appropriate daily servings based upon your dog’s weight. Recommended dog supplements for homemade food that should always be included when you cook at home for your senior dog. 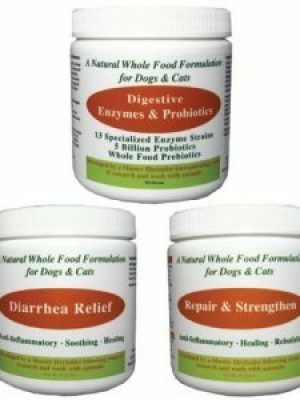 Highly recommended herbs and supplements for each particular illness/disease your best friend is battling. A helpful question and answer section. Note: For Diabetic Friendly Recipes: Simply eliminate the grain from the recipes and adjust the meat and vegetables by 50% each. Example: If a recipe calls for ¼ cup of brown rice. For a diabetic friendly recipe, eliminate the brown rice and increase the protein and vegetables by 1/8 cup each. As soon as you place the order, you’ll receive a receipt on your screen saying “Thank you. Your order has been received.” The download link is directly on this same page (receipt). Scroll down to the “Order Details” section and you’ll see “Download: Homemade Dog Food Recipes Book for Sick Dogs. Click there to download and save the book to your computer. However, if you have any problems, just click here to contact us and we’ll send you a copy right away. We’re here to support you along the way! You’re not alone in your journey. The cost of homemade food recipes for sick dogs eBook is $9.99 which you purchase directly from us by clicking on one of the orange “Add to Cart” buttons on this page. If you’re looking for a “real” book aka a paper-back version of our book, then you have to purchase that from Amazon. Just make sure that you purchase the FOURTH EDITION of the book, so that you get the most updated book with all the benefits. For some reason, Amazon shows all the previous versions as well. The cost for the paper-back book is $13.33. Click here to purchase from Amazon. Simply put, our book is not only the easiest tool you’ll find to cook for your dog, but of the highest quality in terms of what’s included inside the book. We are 100% confident that you’ll love the book as much as we do. If you are not satisfied for any reason, just let us know within 60 days for a full refund of your purchase price of the eBook. If you purchase a hard copy of the book through Amazon though, you have to return it through them like you would any other Amazon product. Unfortunately, we can’t help with that. Can I feed my senior dog these recipes if they have limitations on their phosphorus intake? Yes! This book includes several homemade dog food recipes for dogs who need a low phosphorus diet! Are the recipes in this book designed by a qualified canine nutritionist? Yes! 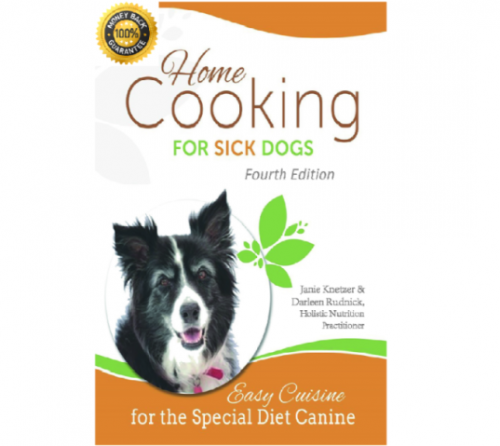 Unlike other canine pet cookbooks written by well-intentioned dog owners, “Homemade Cooking for Sick Dogs” was written under the consultation of a certified nutritionist. Darlene Rudnick has been a student of nutrition since 1987 and her qualifications certainly speak for themselves! Does my dog have to be sick to eat the recipes from this book? Not at all! Whether your dog is suffering from current illness or whether they are completely healthy, the recipes in this book are designed to create well-rounded and appealing meals! Can I feed my dog these recipes if they have 'X' blood creatinine levels & Kidney Issues. Yes! The kidney disease recipes in this book are safe for all levels of Creatinine in the blood! Can I feed my dog these recipes if he or she has elevated liver enzymes? The recipes found in my book can be used for dogs with Early Stage Liver Disease. 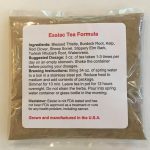 If your dog has elevated liver enzymes due to ammonia in the blood (Hepatic Encephalopathy) or he or she is vomiting bile due to early stage liver disease; these recipes can be used. The recipes ARE NOT MEANT for dogs who are STORING COPPER in their liver. If you’re not sure, please ask your vet if your dog has copper storage disease. Also, dogs who are in late stage liver disease, may develop kidney problems and suffer seizures associated with their liver problems. If this is the case for your dog, then the recipes in this book for liver disease ARE NOT recommended. I recommend talking to a pet nutritionist who can personalize recipes for your dog in either of these cases. Is home cooking for my dog going to be expensive? Backed by nutritional science, the recipes in this book not only provide your dog with healthy, whole nutrition, but they also allow you to cater your dog’s specific needs by supplementing deficiencies caused by illness. Our senior dog recipes were developed specifically for dogs who are battling sickness and/or diagnosed with Cancer, Liver Disease, Kidney Disease, Pancreatitis, Seizures or Heart Disease. 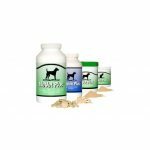 Meals were developed by a Holistic Nutrition Practitioner for dogs. They are easy to prepare and provide your pet with exceptional nutritional value. Recipes contain 3-5 ingredients and are meant to be cooked in a crock pot, but can easily be converted to cook on top of the stove or in the oven if necessary. Includes a 100% Satisfaction Guarantee!